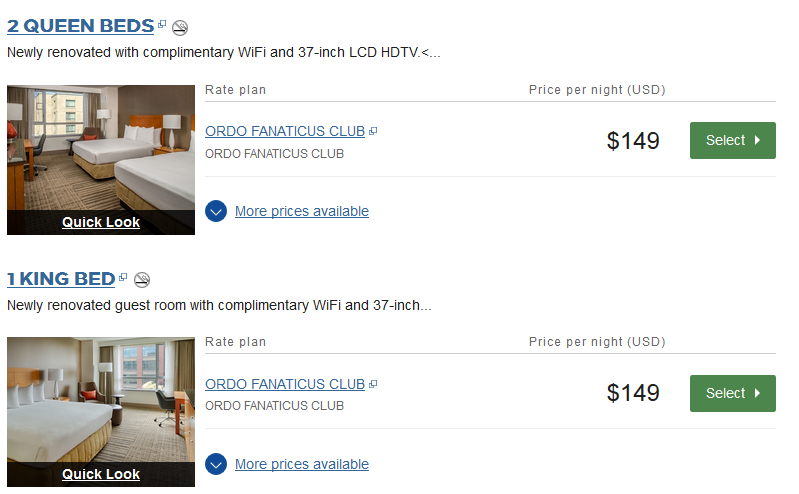 Hotel Group Code: OWG for our special discount rate! Click this link to book your room now! Hello everyone! I wanted to take some time to put together a good informational post about our venue. Some of you might already be familiar and we are happy to see you returning. For all the new people coming through, this venue is the nicest place I have seen an OFCC happen. From the humble beginnings of the barn and the armory, the Hilton delivers comfort and luxury like no other! We booked the largest venue offered by the Hilton, The Heritage Ballroom. That’s 11,000 square feet dedicated to your gaming weekend. High pile carpets caress your feet as you stand across from your opponents (Yes, I played barefoot one year). 18 feet of ceiling space softens the roar of battle coming from across the hall. Brilliant dynamic lighting sets the mood and provides for a not-so-squinty Sunday morning. A dedicated entrance on the east side of the Hilton along with a section of 5 minute parking make loading your things into the hall fast and convenient. Parking is not included in your room stay. The Hilton has parking in their secure garage for $18 per day. However, there are plenty of parking options for the weekend. Any public metered spot is available for free on the weekend. There is also a cheaper pay garage NE of the Hilton, the Park N’ Go located with an entrance off W 6th St.
Feel free to use the 5 minute loading/unloading zone located off Columbia St to unload your army and bags into the hall. Please note, we will be using part of this area for loading/unloading of terrain and tables Sunday at 4PM. What venue would be complete without some cool stuff around it? The Downtown Vancouver area always delivers. Almost all of it walkable. The Vancouver Farmers Market takes place every weekend morning across the street in Esther Short Park. Esther Short Park will host Viva Vancouver Latin Festival on the same weekend. Loowit Brewing Company is right out the hall doors and across the street. They fill growlers! Joe’s Crab Shack and its infamously long wait times is within walking distance and will provide Shark Bites by the tray full. Take a tour of the new waterfront reconstruction built on top of the hollowed gaming grounds previously provided by the Red Lion at the Quay. So many other restaurants, bars, and everything else all right next to a great gaming weekend. Please follow the steps below to get our discounted room rate before they are all gone! We have a limited amount of rooms available at this low price, so act fast. The room block closes on 8/1 and has the possibility of running out of rooms. For the Good of the Order! 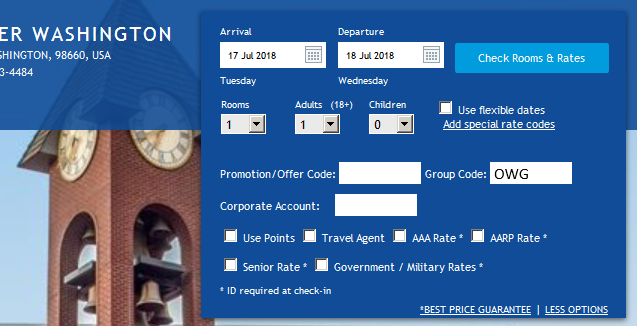 You can book through this link or follow the instructions below to do it the manual way. Click on "More Options" in the banner at the top. Now click on "Add special rate codes" to further extend the search options. In the "Group Code" field, enter "OWG". Now select your dates, August 16-18, and the number of people and click "Check Rooms & Rates". (Please note additional cost for more than 2 guests will be added to the room rate - 4 guests = $189 per night). And BOOK YOUR ROOM!! It is that easy!! If you have any issues with receiving these rates or booking a room, please reach out to @evil_bryan or @DisruptiveConduct. Do we know if we'll have access to the rear parking lot like we did last year?